Four venues have cancelled their bookings with the Sherri Tenpenny anti-vaccine tour organiser Stephanie Messenger, and her fake foundation which distastefully exploits the names and images of Nelson Mandela, Martin Luther King Jr, and Mahatma Gandhi. It should be noted that the Nelson Mandela Foundation is already in discussion with its intellectual property and governance personnel about the abuse of Madiba’s name and image. 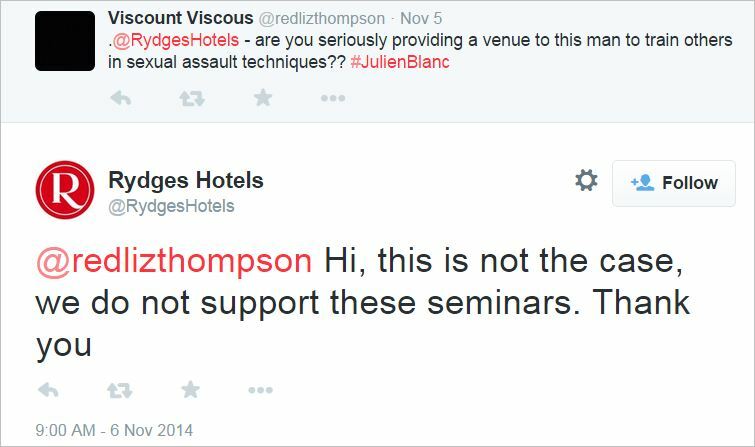 More on Rydges Hotels below. 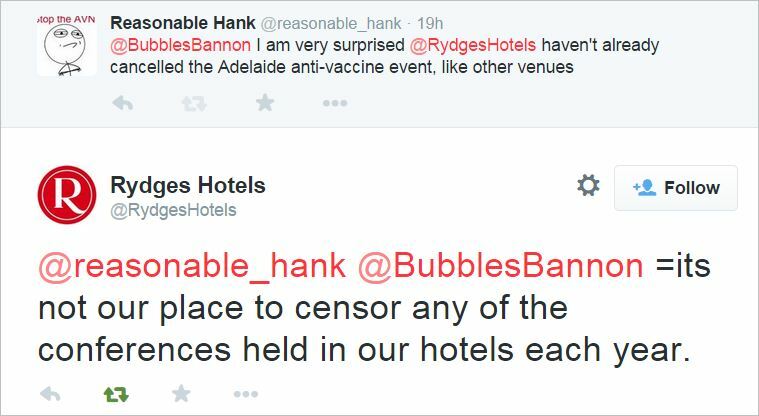 Two of the four venues which have cancelled their booking with Messenger’s fake foundation have had something more concerning to convey; although, anyone who has had any dealings with the anti-vaccine movement will expect this behaviour in the first instance. The venues have stated they were misled by Messenger about the beliefs and intent of the events. Thank you for writing to us with your concerns. We appreciate that you have written to us in such a professional and well explained manner. We have taken into account the email you have sent below. The lady that had booked the event with us never mentioned that this event would be held for such a nasty cause. The Concord Function Centre takes its social responsibilities very seriously, and after much research and consideration of all available facts we have decided to withdraw from providing our services to the event being held in March 14th and March 15th. In short – Tenpenny is banned from entering Concord Function Centre! The Concord Function Centre deserve all our thanks and support that we can muster. All of these venues and their staff must be applauded for their strong stance in defence of public and paediatric health. Kudos. Feel free to email Rydges. I have already witnessed major bookings being cancelled immediately, because of this decision. This leaves only Michael’s Oriental Restaurant, in Brisbane, and Rydges South Park, in Adelaide. This entry was posted in anti-vaccination dishonesty, australian vaccination network, AVN, meryl dorey, skeptic, stop the australian vaccination network and tagged anti vaccination, AVN, AVsN, Concord Function Centre, dishonesty, GanKinMan Foundation, Kareela Golf Club. Michael's Oriental Restaurant, meryl dorey, Quality Hotel Mermaid Waters, Rydge's South Park Adelaide, Rydges Hotels, Sherri Tenpenny, Stephanie Messenger. Bookmark the permalink. The long FB response from Concord to Sam is certainly eye-opening and is one of the most-honest, no-corporate-speak responses I’ve seen. They certainly are to be thanked. Unfortunately, Mermaid’s FB page seems to have gone. It would be a shame if they’ve acted responsibly and then crumbled under pressure. But some of the anti-conference comments to all venues left a lot to be desired. I think some people forget that not everyone is as close to this issue as they might be. Most people have no idea there’s an anti-vax lobby and are hardly likely to sit up- and take notice the moment some rabid “pro-vaxxers” start barking at them..
OMG that woman is SHAMELESS. On that outraged blog post about the pro-vax lobby trying to stomp on her right to free speech, at the very bottom there is A LINK TO HER STORE. And they say the Pharma industry is evil cos it makes a profit. Why are they saints for doing the exact same thing??? SMH. Pingback: The #StopTenpenny Campaign against anti-vaccination seminars in Australia – Podcast Report | Evidence, Please.